Bio: Adelaide born (1972) and bred, I support the Adelaide Crows in the AFL, Sturt in the SANFL and Adelaide Uni in the South Australian amateurs (the club I played for). I love footy and I love travel. For Australian Rules football to survive in this global economy I think it must continue to grow - which is in part why I co-founded this news site to help make a positive contribution to that goal - spreading the news, encouraging all the volunteers and hopefully helping to cross-pollinate ideas and inspiration. My travels outside of Australia have taken me to New Zealand, Singapore, England, Wales, Scotland, Northern Ireland, Republic of Ireland, France, Spain, Italy, Austria, Germany, Denmark, Belgium, The Netherlands, Tonga, South Africa, Lesotho, Swaziland, Zimbabwe, Zambia, Botswana, China, Mongolia, Hawaii and Canada. 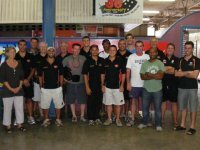 Besides my amateur football career with Adelaide Uni I toured South Africa with "the Convicts" in 2005, have been in regular contact with most international leagues and the AFL for several years through WFN and was a keen observer/reporter/fan at the 2005, 2008, 2011 International Cups in Victoria and NSW. 2009 PNG Kupundas vs Boomerangs In March 2009 an elite Australian Indigenous youth squad, the Flying Boomerangs, toured Papua New Guinea for the first time, playing two matches against PNG youth Kupundas squads - a loss in Port Moresby and a win in Lae. 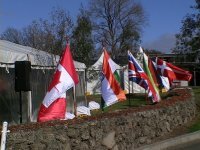 2009 New Zealand Under 20 NPC Under 20 National Provincial Championships, staged in March '09 in Christchurch and won by Auckland. 2009 Youth Oceania Cup - Day One Suva, Fiji, 19th December 2009 Australian Football Oceania Youth Championships. Winner: Tonga. Photos courtesy of FDP’s Max Wolfgramm, AFL consultant, Alea Williams, and AFL Fiji. 2009 Youth Oceania Cup - Day Two Suva, Fiji, 20th December 2009 Australian Football Oceania Youth Championships. Winner: Tonga. 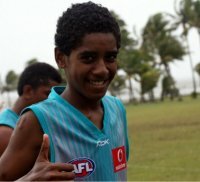 Photos courtesy of FDP’s Max Wolfgramm, AFL consultant, Alea Williams, and AFL Fiji. 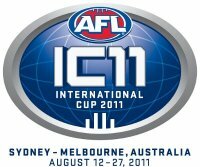 IC11 - AFL International Cup 2011 Photos from the 4th International Cup in Australian Football, held in Sydney and Melbourne in August 2011.